Published June 28, 2014 at 318 × 477 in Free Wellness Webinars. 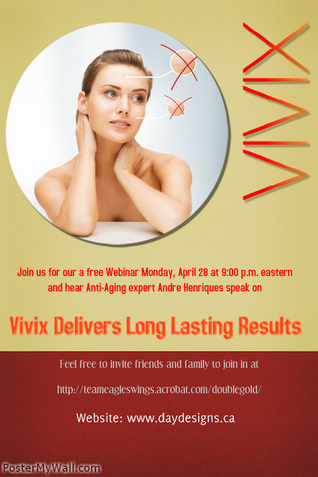 Long lasting results with Vivix Anti-aging Serum! addressing the 4 key factors of aging, using natural ingredients, Vivix anti-aging serum goes along way to rejuvenate your body. I love the header you chose, This location brings back so many fond memories of growing up, wish I had a little piece of Lake Lillian to call my own. I am interested in your anti-aging product Vivix. I look forward to the webinar.